The spot directly in front of the keyboard is a favorite place for my big cat to curl up and “make muffins” on my mid-section as I try to do some bookkeeping. I have to wrap my forearms completely around him in order to keep working which just encourages him to continue to poke his sharp claws into my rib cage. This leads to work stoppage as I find the clippers and trim those nails! The fax machine and printer are monstrous robots that must be set in their place – leaving the modem askew, the wireless hub on the floor and the printer covered in cat hair. Any small space – a cubby hole, a box, the back of the machine rack – is a heavenly hiding place – which also adds to the work when it is time to clean the studio. And, of course, a sleeping cat suddenly wakens the moment you hit the record button and starts to talk – and talk and talk – and in order to actually get a clean take the cat must be gently escorted out of the studio. Noisy critters! Even when they purr. I recorded a few years ago in a large home studio usually used for music production (and by home studio I mean the whole home was turned into a studio) and the voiceover area was one room with the engineer and his computers, a leather couch with the clients, the microphone with the talent and a very large purring cat. You would have thought that the computer fans and the sound of the client’s leather jacket rubbing on the leather couch would have been the sound issue, but no – it was the purring cat. But, when they are quiet and relatively well behaved – cats are quite decorative and having pets in the studio is one of the perks of working at home. I wouldn’t have it any other way. I was afraid to turn it over to see what I had actually written. So I put it off for a while, taking it to my desk where I prepared myself mentally and emotionally. I feared the worse. That not only had I not done any of the items on my list, but that I would have no idea what they meant! An hour and a half later after being distracted by YouTube and Wimp links from Facebook, I flipped the card over. Right off the bat, I had to think about the first item on the list. The cancellation ink was covering some of my messy handwriting, but finally I deciphered it – and shook my head in dismay. The very first thing and I had not done it. But glancing at the rest of the list, I saw that I was going to get a B for effort (maybe a B minus), because I had done 95% of the rest of the list. The last item was a two-parter. Of course you are wondering what was on my list – well, that part is sort of a secret. But suffice to say the action items stemmed from my personal “golden nuggets” exposed at FaffCon 2 in Atlanta. The post card was a great idea! 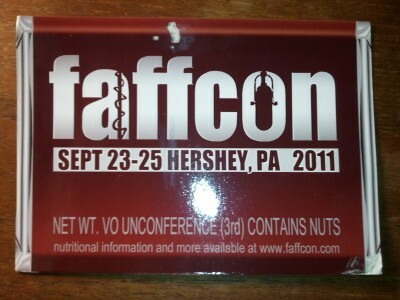 Not only am I re-energized to look at the list again, but I am getting excited about FaffCon 3 in Hershey PA in September. George Washington III just blogged about his experience in Atlanta – relating it to summer camp for adults. Since we are going to be in Hershey PA – I’ll bet we’ll get S’Mores this time and it will really feel like camp! If you are just starting out, this formula is predicated by knowing what you do well and finding the people who want to buy what you have to sell. If you have been in the business for a while – or a long while – you may have the same problem I am trying to address – too many names in my contact list. And if you are trying to add new qualified leads to your list, that method is evolving. Part one – knowing what you have to sell. You have to know what sets you apart from the rest of the people selling themselves as voice talent. What kind of scripts showcase your unique sound and style? Some of this can be developed in classes, workshops and with coaches. But so much of it is really done on our own as we listen, analyze and talk back to what we are hearing as we go about our normal day. After you truly know that you can compete in an area of voiceover, it is time to create a demo that showcases this particular talent. Just what constitutes a demo these days continues to evolve, and will depend in part on what you do well, where you live, what kind of technical skills you have – and whether or not you subscribe to web-based casting services with their unique SEO/SEM. Part two – finding the people who want to buy what you have to sell means basic marketing skills. This is an element of voiceover “training” that most classes leave out. And it is arguably more important than your talent. I recently heard a story on the radio about how social networks are playing a much more important role in the search for potential clients or employess. People want to work with people who other people trust. While preferring to work with people you know and trust isn’t new, the days of approaching a complete stranger with your resume and getting the job are waning as more and more people jump into the referral pool. My summer-time goal is to whittle down my huge contact list and focus on those who actually know my name and what I do.